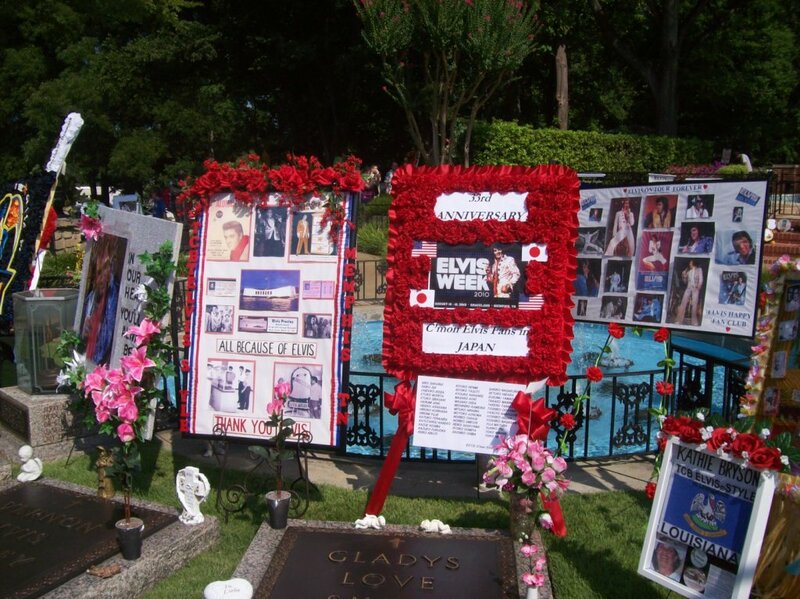 Jerry & Diane Ebbing made a side trip to Graceland on their way to the Reunion in Chattanooga. 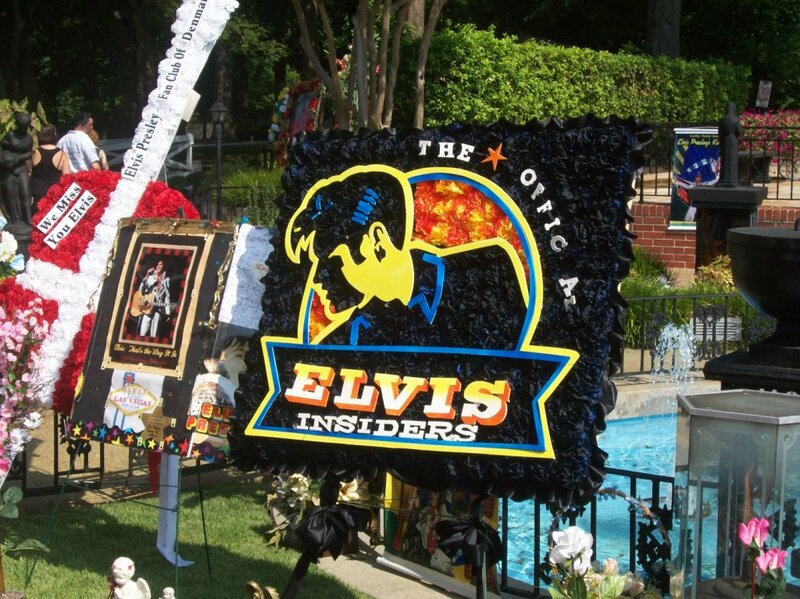 This year marked the 33rd anniversary of Elvis' death. It was probably for the best that they stopped on their way down as August 16th would have been very crowded. Picture on left: Poster evidently from Hawaii. 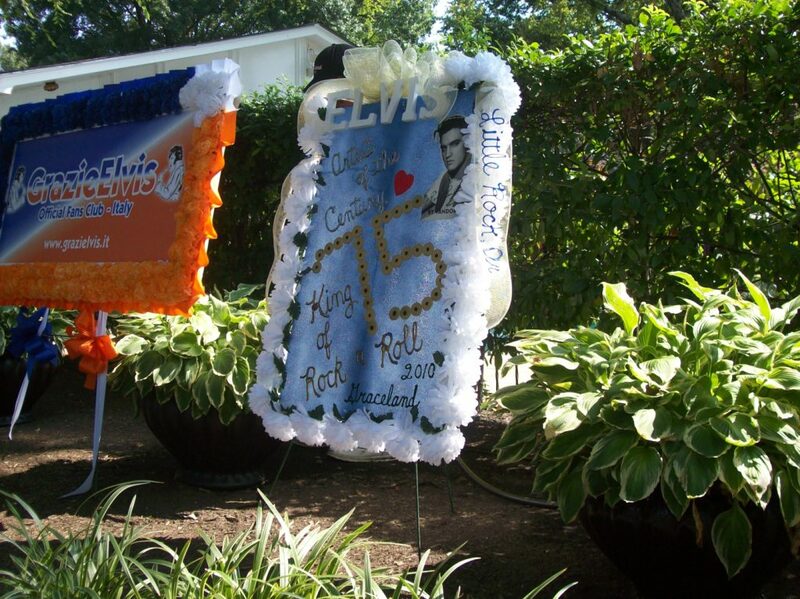 Aloha Elvis, All because of Elvis, Thank You... wreath on the right is from Elvis fans in Japan marking the 33rd anniversary of Elvis' death. 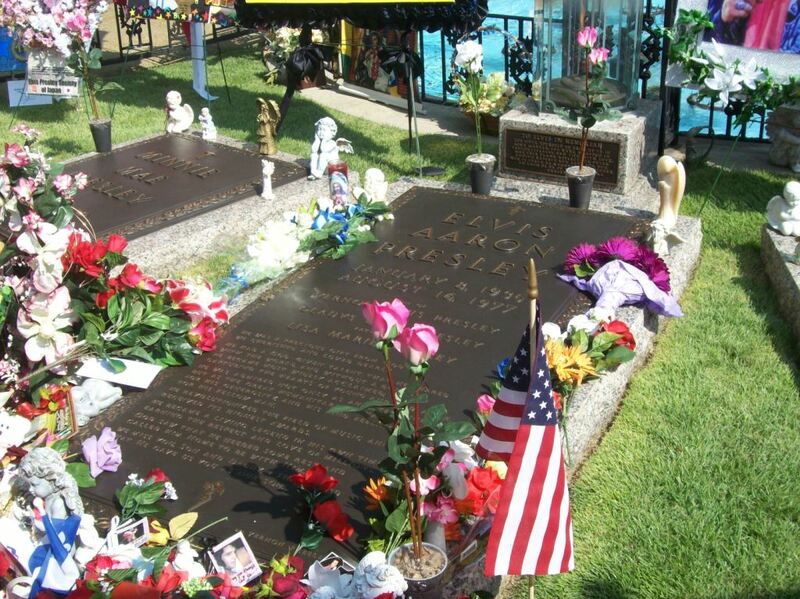 On the right, a better view of Elvis' marker. 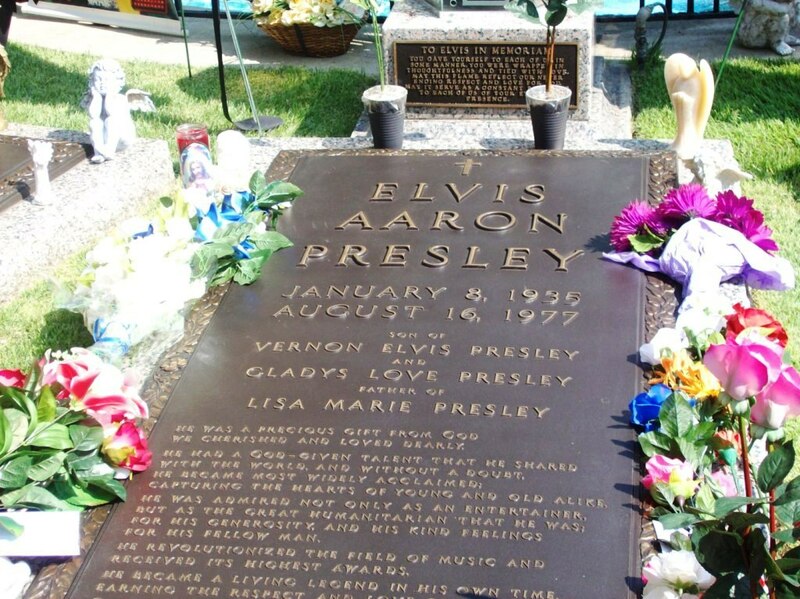 Elvis Aaron Presley, born January 8, 1935, died August 16, 1977. 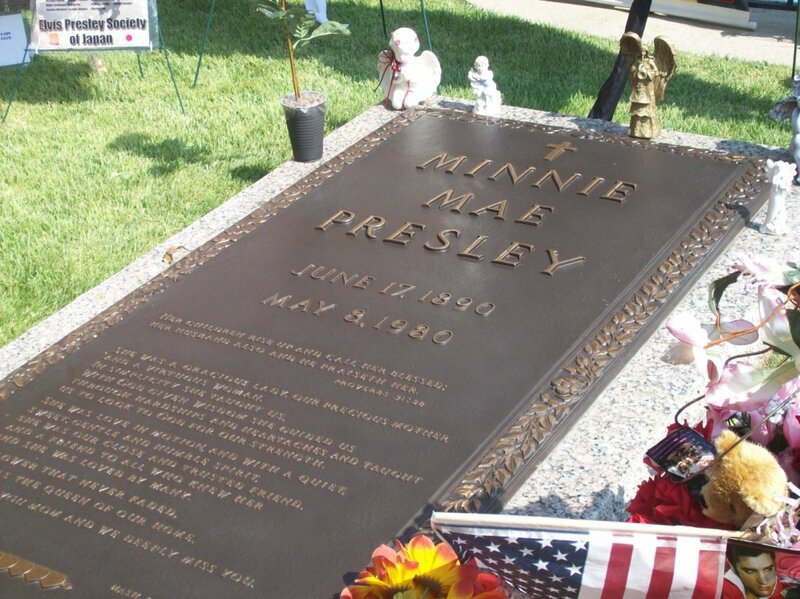 Minnie Mae Presley's burial plot. Minnie was born June 17, 1890 and died on May 8, 1980. She was Elvis' paternal grandmother. 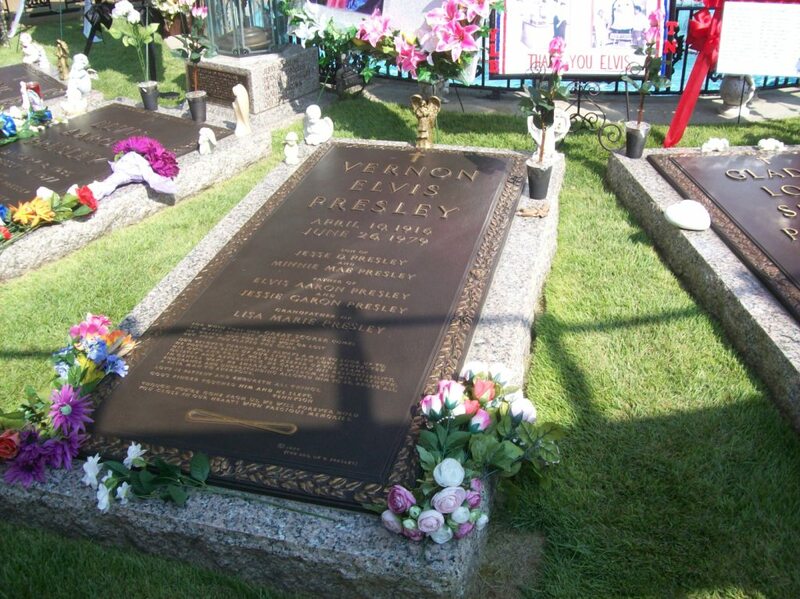 For security purposes, Vernon Presley, with special permission from the city, had the gravesites of Elvis and his mother, Gladys, moved from Forest Hill Cemetery to Graceland in October 1977. 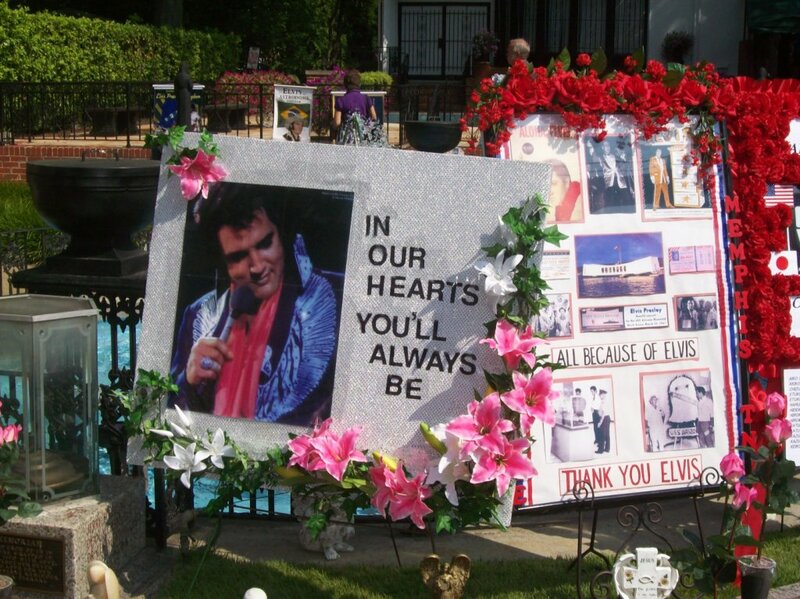 Since then the garden has become the final resting place for Elvis' father & paternal grandmother as well. 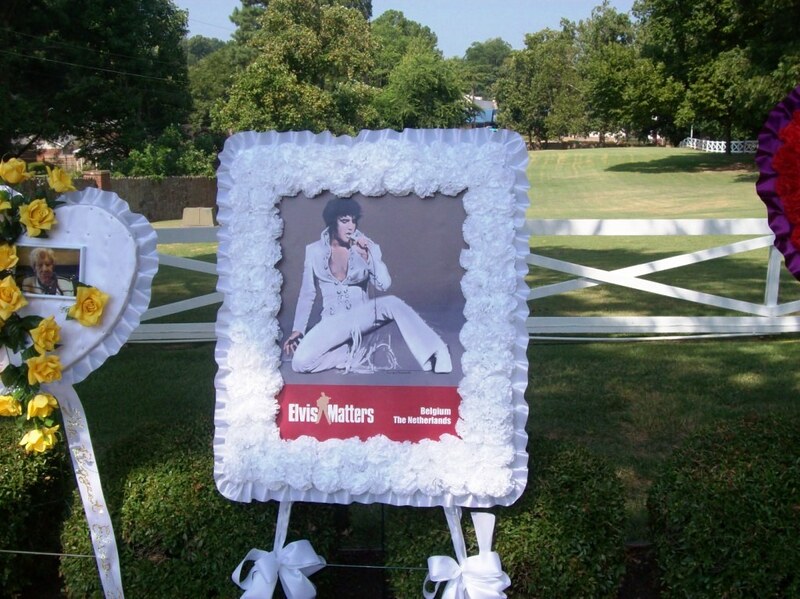 A small marker has also been placed in memory of Elvis' stillborn twin brother. The large marble cross was Gladys Presley's original monument at Forest Hill. 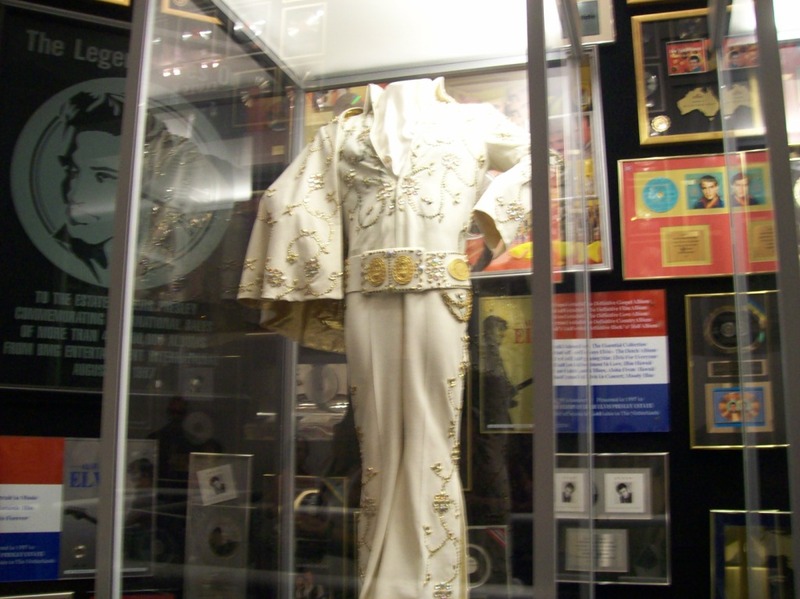 The statue of Jesus with outstreched arms was a gift to Elvis from his friends on Christmas. 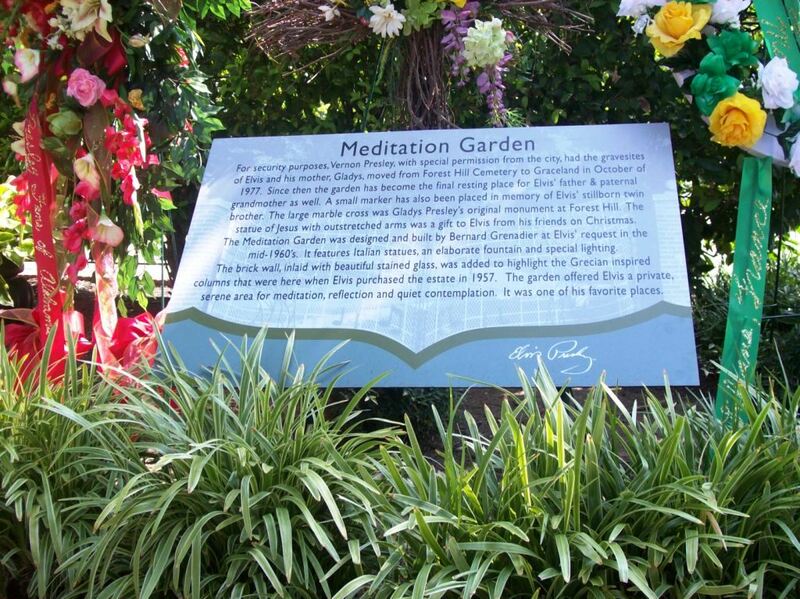 The Meditation Garden was designed and built by Bernard Grenadier at Elvis' request in the mid-1960s. It features Italian statues, and elaborate fountain and special lighting. The brick wall inlaid with beautiful stained glass was added to highlight the Grecian inspired columns that were here when Elvis purchased the estate in 1957. 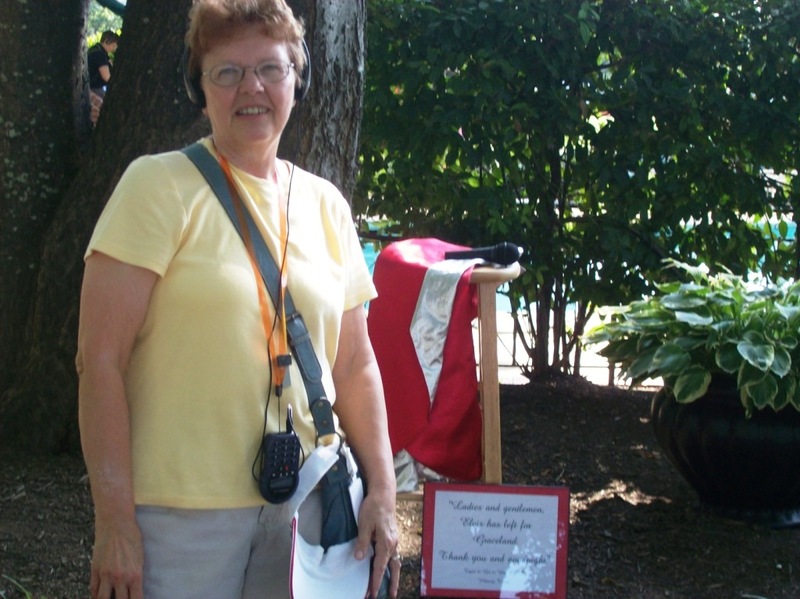 The garden offered Elvis a private, serene area for meditation, reflection and quiet contemplation. It was one of his favorite places. On the right are more wreaths. Grazie Elvis official fan club of Italy; and one depicting Elvis as the "Artist of the Century" "King of Rock & Roll" marking the 75 anniversary year of Elvis birth. It's from fans in Little Rock Arkansas. 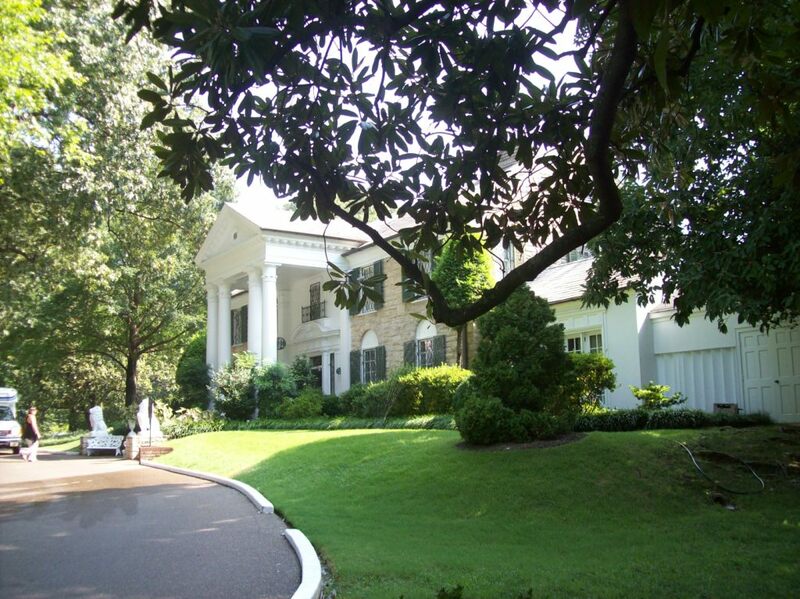 Diane Ebbing bids farewell to Graceland. 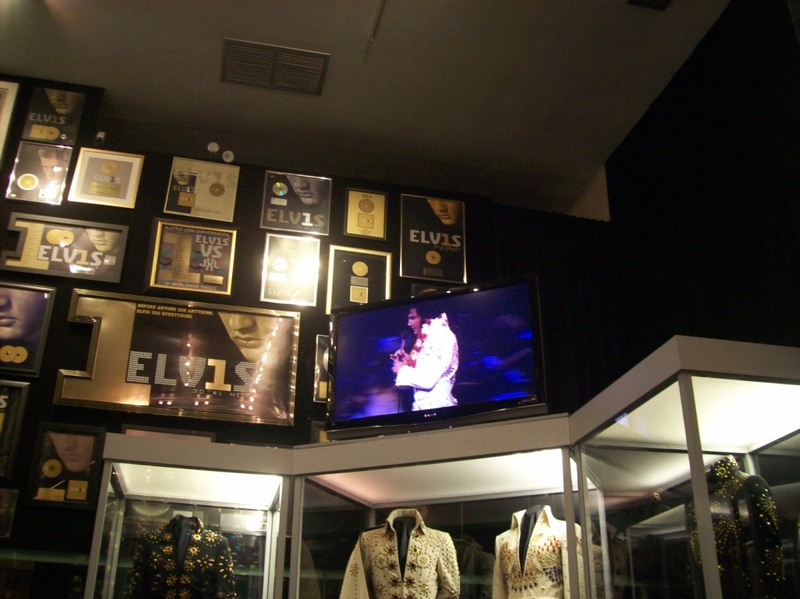 Sign reads, "Ladies and gentlemen, Elvis has left for Graceland. 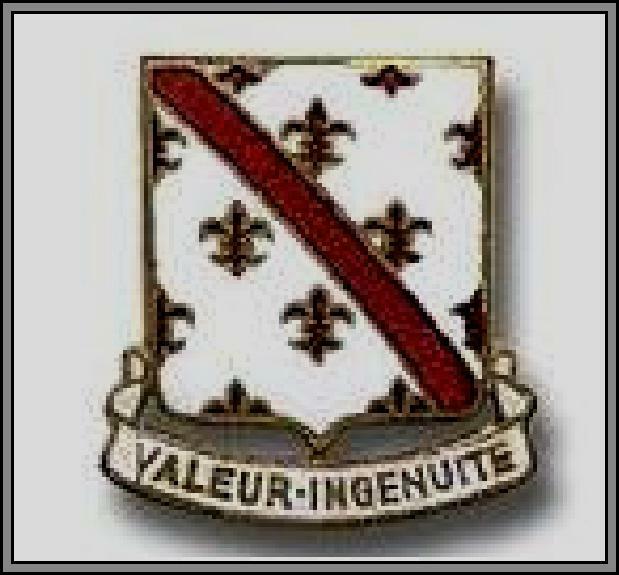 Thank you and goodnight." On the right, Graceland manor with its Grecian columns.